“Over here” was about a mile and a half away from the Altamont Fairgrounds campus. Just then, a pickup truck zipped by me on its way to the main parking lot. Fine, okay, you win. 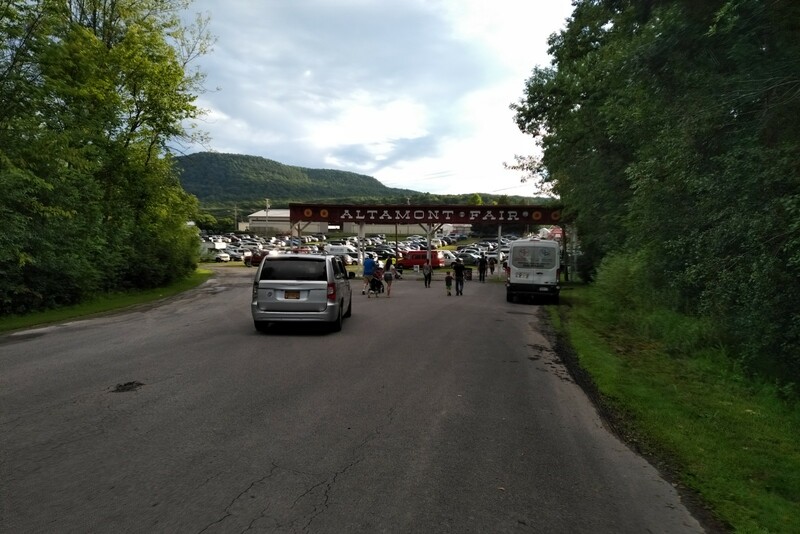 And after parking my car in the deepest, farthest portion of the parking area -as directed by the parking lot crew – I trudged all the way to the Altamont Fair entrance. Trust me, once you get past that gate, you’re still hiking uphill to get to the entrance. Finally made it. So worn out. But I need to see how things turned out. 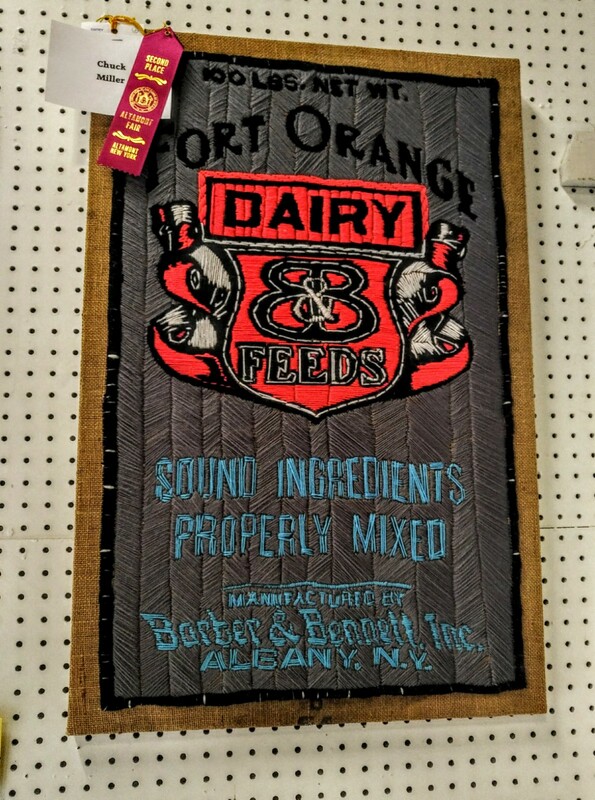 First stop … the Arts and Crafts building, where one of my burlap stitching projects – the Fort Orange Dairy and Seeds burlap construct – was submitted in that location. Where is it? I don’t see it anywhere. I ask one of the volunteers. 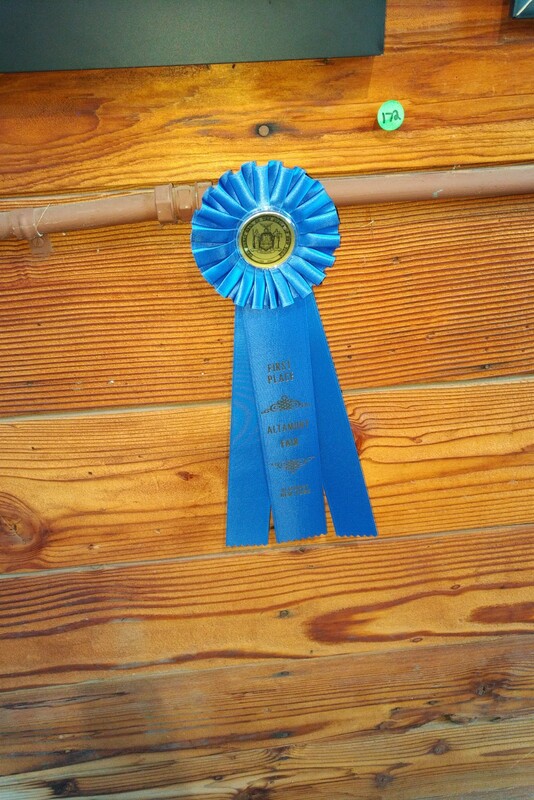 That’s a second place silk, my first ever competitive ribbon in this burlap yarn crewel whatever I’m doing output. Hot damn. Considering that last year I had a Dream Window in this building and it only earned an Honorable Mention … I would say I’ve snagged some better results. Okay. Now to head over to the Fine Arts Building. No, wait. Can’t go in there. Instead, I go to he restaurant adjacent to the Fine Arts building – a little grillery called Josie’s – and chomp down on a mushroom hamburger. I then go over to the bar across the street and sing one karaoke song. In this case, it was “I Was Wrong” by Social Distortion. And let me tell you, after hiking all the way from the parking lot AND then singing what’s essentially the opposite of a ballad, I was worn out. But it’s a good worn out. Then I had to wait. I couldn’t cross the street until these guys passed through. All right, no more stalling. And right off the bat, I found Infrared Horizon 787. No ribbon, infrared or otherwise. Nertz. 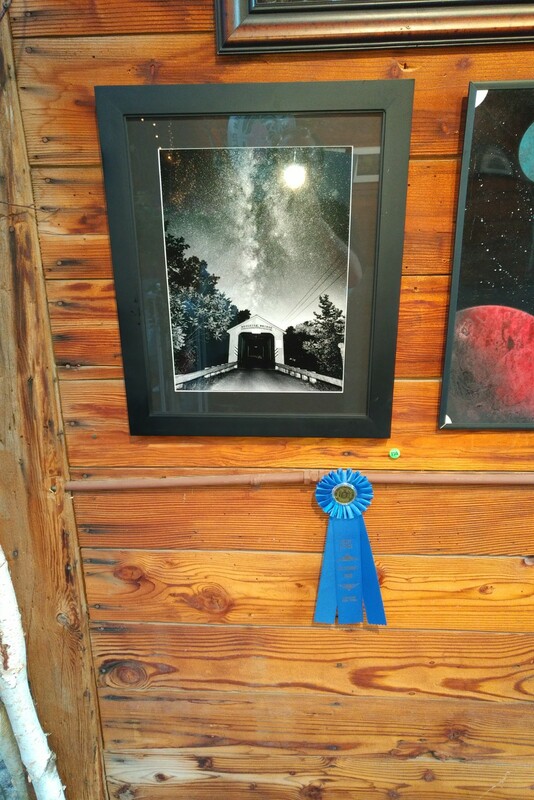 Last year I had my infrared picture Farrell take a blue ribbon in this competition, this year … nada. Well, there’s another color image in my submission folder, maybe The Mahari Stream picked up a silk. Considering that it didn’t get chosen at the Iowa State Fair or at the New York State Fair, I’m having my doubts. That’s a yellow silk dangling from The Mahari Stream! Ooh. Let me get a closer look at this. Yep. Straight up third place. A third place here, a second place in the Arts and Crafts location. 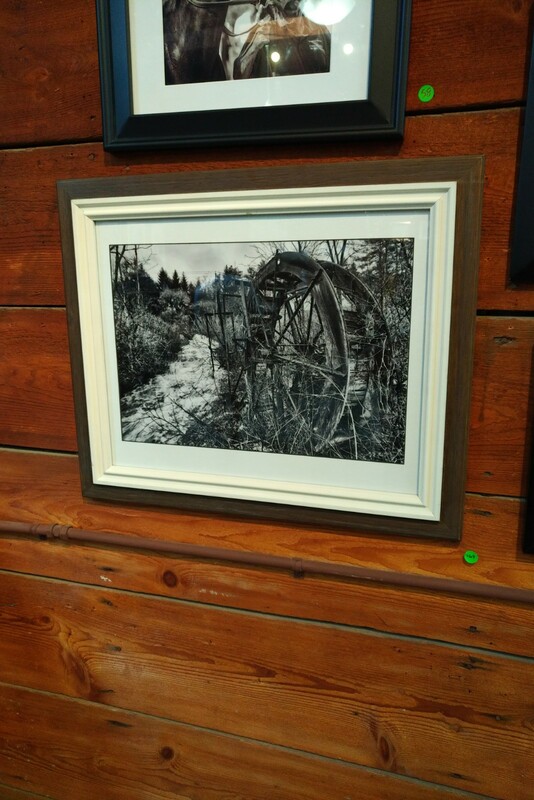 I submitted one entry in the black and white category, my photo The Waterwheel of Greenfield Center. This picture was originally scheduled for Syracuse, and at the last minute I yanked it from the submission pile and re-framed it for Altamont. Did not work. If nothing else, at least I have a nice framed picture that might end up on someone’s wall. All that’s left is my Washington County 2:30 a.m. picture. 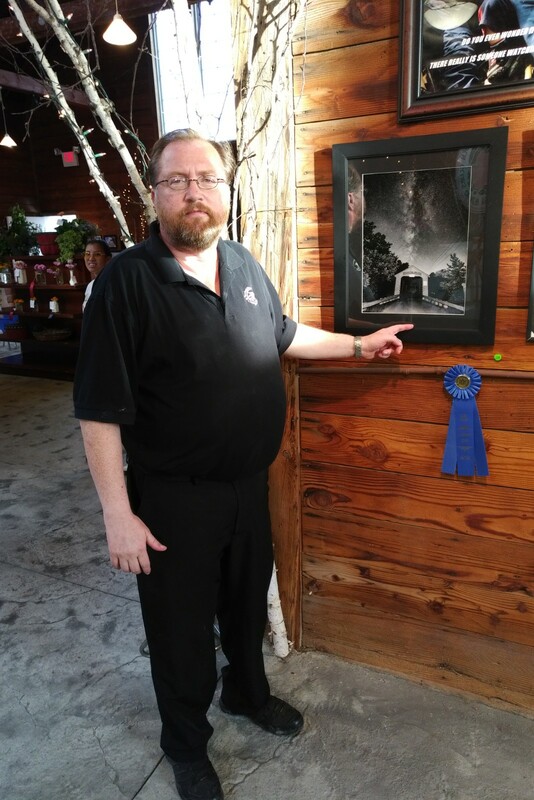 The Fine Arts themed category this year was “It Came From Outer Space,” and I thought I could either submit this picture or The Cumulo-Nimbus Eclipse image from last year. No brainer. Covered bridge and Milky Way wins out every time. 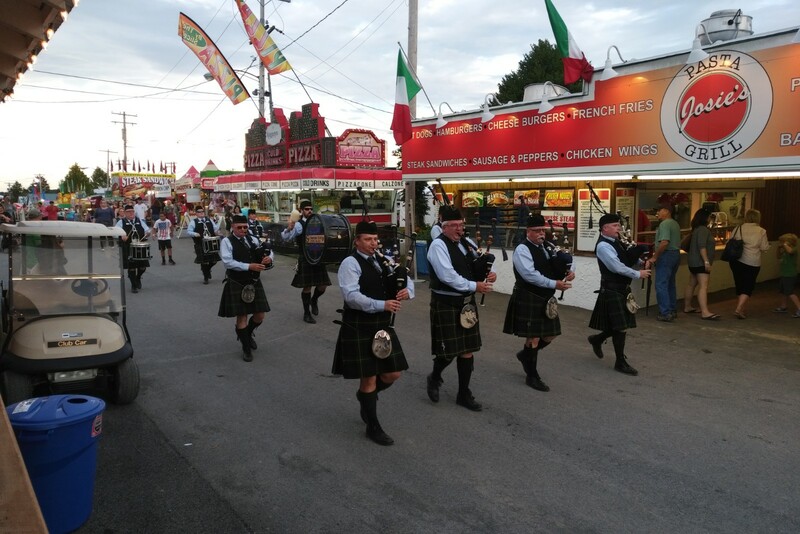 Now this picture did NOT get any love from the New York State Fair … was I wrong in submitting it to Altamont? Am I chasing trains that aren’t even on the schedule? And then I see the picture. Hey everyone … look at what hangs from the pole, just underneath my picture. That’s a big fat frilly blue rubbon … first prize in the themed category! There it is!! I hit the triple! 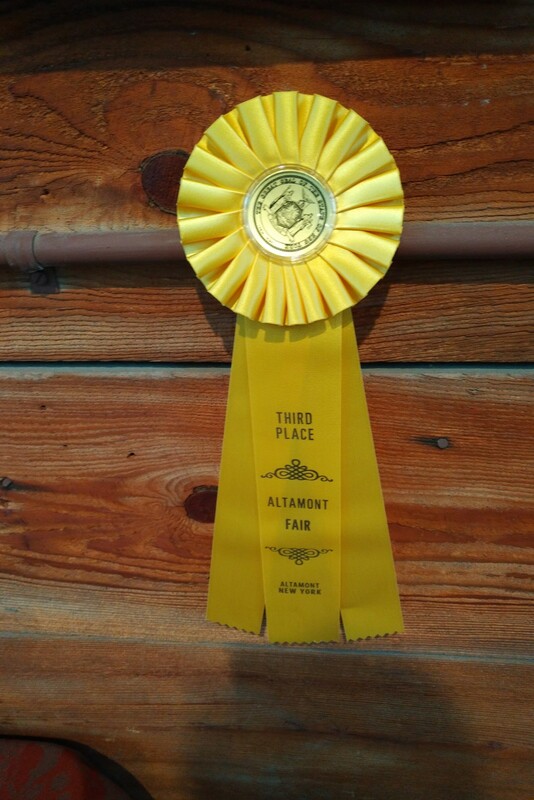 A first place, a second and a third in Altamont Fair competition! 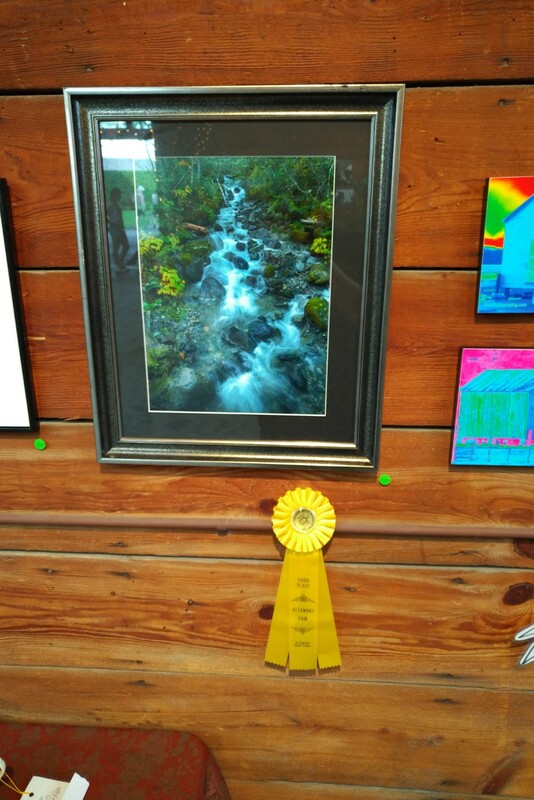 And two of the ribbons went to images that were rejected in Syracuse – heck, The Mahari Stream was bounced from Iowa as well, and it still picked up a sweet yellow silk! And for these images … it’s not over yet. Oh yeah, and there’s one other thing. And this is a request for you, my dear wonderful readers. 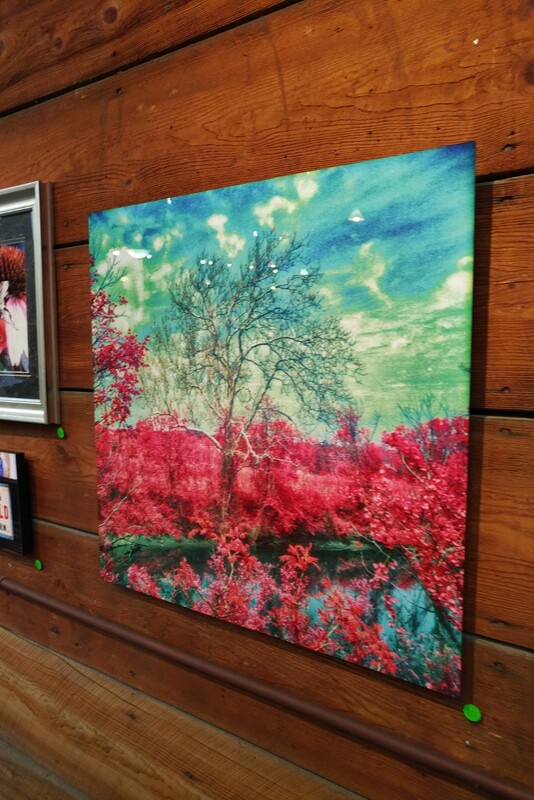 If you happen to go to the Altamont Fair this year … and you make your way to the Fine Arts Barn … and you happen to see a box marked “People’s Choice vote” – where you can vote for your favorite entry in the barn – may I please suggest that you consider voting for image #172. That’s the one I’m pointing at in the picture. And I’ll make you a deal. I will post a return picture on this blog with me pointing at this photo and grinning so wide you would think the Joker was depressed by comparison. Competition Season’s not over yet. Not by a mile. Or a mile and a half … which is how long I had to walk back to my car. Oh yeah, I did pass that Ford pickup truck. I think he was still spinning his tires in that swampy, muddy parking lot. Now go to Saratoga u on a roll, well done! Yahoo!!!!! Well done! I’m beginning to think the judges at the Saracuse judges table are related to a TU female blogger, who’ll remain nameless.